Julie realises that they've probably all got lice, and that's why they've been scratching recently. Helen checks Julie's hair and confirms she does have lice. Julie is frantic and checks Philip, Rosemary and Helen and all of them have lice. 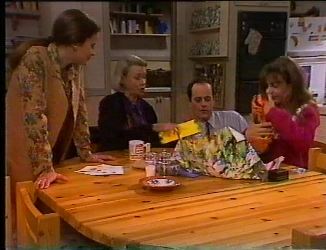 Julie blames Hannah's ‘grubby little friends' and goes off to a chemist in Eden Hills to get de- lousing lotion, telling them all to stay up until she gets back. Philip checks Holly and apparently she is fine. Lou tells Cheryl about selling a van to a Theatre Company, and is delivering it to them tomorrow. CHERYL: So what else has been happening? LOU: You mean apart from the earthquakes, the floods and the plagues of dinosaurs. CHERYL: What is the gossip? Who've you been talking to? CHERYL: Oh yes, with one of your trucks, I hope. Cheryl tells Lou that she doesn't trust Rosemary, calling her a ‘wheeler dealer.' Cheryl's dislike of Rosemary leads the conversation on to Marlene. Cheryl says Marlene told her she was leaving. Lou suggests Cheryl really wants Marlene to stay, Cheryl and Lou kiss. Julie returns with the lotion and demands they all take showers. Later they all stand in a row picking lice from each other's hair. Julie crams all of their towels into the washing machine, and washes the brushes and other utensils in the sink. HELEN: May we go to bed now, please? They all rush to their feet and leave the room. Julie remembers she has to hang up the washing and Philip offers to help her. Julie quickly hangs up the washing, Philip handing her clothes pegs. Philip pleads with Julie to go to bed as they have a busy day tomorrow with Debbie's therapy session at the clinic as well as Hannah's birthday. JULIE: Do you think I'd leave my house to be infested with a plague of lice? What would the neighbours say? PHILIP: Who cares? Can't we just go to bed? 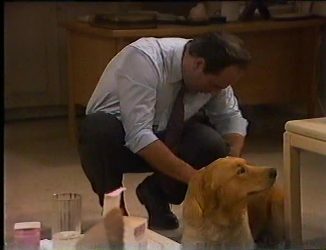 It's the next morning and Hannah is excitedly opening her birthday presents, including a necklace, clothes and she gets a fax from Michael. They tell her they need to get dressed so they can go visit Debbie. HANNAH: Do we have to, on my birthday? Can't we put it off until some other time? HANNAH: It's not fair. Just because Debbie won't eat properly. HELEN: Oh come on darling, don't be like that. You want to see your sister get better, don't you? HANNAH: I suppose so. But why does she have to mess up my birthday? JULIE: Oh don't worry darling. It won't take long. We'll be out of there before you know it. Julie, Philip and Hannah are admiring Debbie's room at the clinic. Debbie gives Hannah her birthday present, a friendship bracelet that Kim made. 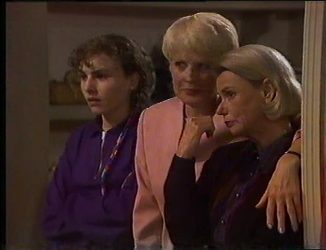 Debbie's counsellor, Rita, introduces herself to the family and asks for them to go through to the counselling session. Debbie tells Rita she really liked the book she lent her, Rita suggests they go and see the movie version sometime. Helen is hanging balloons up in the house when Rosemary arrives. 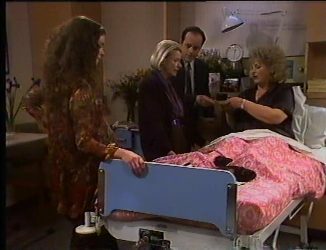 She tells Helen that the doctor says her leg is okay but she should keep off her foot for as long as possible. Helen tells Rosemary that Hannah loved her present, but it was a pity that Rosemary couldn't give it to her herself. Rosemary explains she was at Gaby's going over Helen's outback artist tour idea. She suggests they send the details to her advisors in the states and see what their reaction is. All she needs is a modem. Helen routes around the desk and finds Jim's modem in one of the drawers. Rita asks Debbie to speak about her family and her place in it. Julie interrupts, as she thought they were here to discuss Debbie's eating disorder. Rita says bulimia often stems from problems in the home that they need to identify. Philip says he's prepared to talk about anything if it helps Debbie. Debbie says there have been a few problems, when Michael went to the detention centre and when Julie and Philip split up. Julie says they're fine now and she really doesn't see what any of this has to do with Debbie's problem. They all sit in silence. 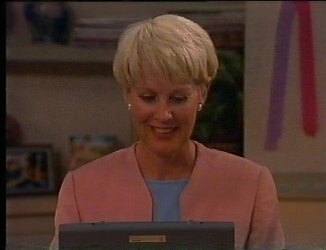 Rosemary is on her laptop, which displays a command to enter a password. Helen enters and asks how everything is going. Rosemary shiftily tries to hide what she's doing, saying everything is fine. As Helen heads off, Rosemary gets back to work. The screen displays the Lassiters Profit Statement. Rosemary smiles. 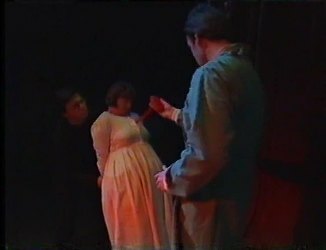 Lou arrives to find two actors, with Down syndrome, performing a play. The director heads over to Lou. Lou has brought the van over and has transfer papers for the director to sign. He asks if Lou can wait until after the scene. Julie says the separation wasn't easy for either of them, and it wasn't a good time at home, but it's all sorted out now. Rita asks if they ever disagree about anything. Julie says no but Philip says occasionally. Philip calls Julie out on them arguing about him taking over the news agency, she called it a mid life crisis. Julie is embarrassed to be talking about this in front of Rita and says that they now have a very successful business partnership. Rita says they made good progress today and did some good ground work for the next session. Julie is shocked that they have to come again, asking if their family is in that much of a mess. Rita assures her that while these things take time, things are going along very nicely. Hannah asks if Debbie can come to her barbecue, Rita says it's a good idea; both Hannah and Debbie are pleased. Philip says he needs to stop by the office on the way back, but promises he'll be there for Hannah's barbecue. 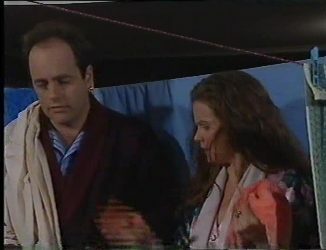 Lou watches intently at the play, as the actress is held captive and one of the actors pulls her heart out. 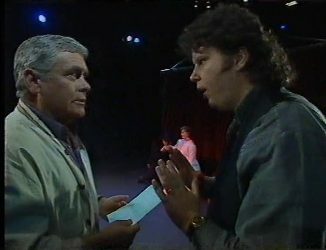 They end the scene and the director goes to speak to Lou, who's clearly absorbed in the play. He tells the director that it was great. The director tells him to come to the performance tonight, Lou says he will, and he'll bring the whole family too. Lou says they don't need to worry about payment, and he'll knock off the road cost as well. The director hopes he isn't doing this out of misplaced sympathy, Lou says it isn't. This is the first bit of theatre he's seen in ages that hasn't made him want to leave after 2 minutes. The family are setting up snacks when there is a knock at the door. Hannah rushes to let her friends in when Julie stops her and answers the door for her. She asks them to line up, and starts checking their heads for lice. Helen is mortified by Julie's behaviour. Julie finds they all have lice, and tells them they can't come to Hannah's party. They all leave, taking Hannah's presents with them. Hannah's upset, telling Julie she's wrecked her whole birthday. Just then they hear a horse neighing. Hannah's friend Gough has arrived with a horse, which is Hannah's birthday present. Hannah is thrilled, saying he's saved her birthday. Julie looks far from impressed though. Philip arrives to visit Gaby, who's made herself some herbal tea to help push the baby along a bit. Philip tells her not to give birth in the next 5 minutes, as he has something to talk to her about. Philip says there's been a computer hacker accessing their files. Apart from the two of them, Helen and Cheryl, someone else must have access to their password. Gaby tells him that she appointed Rosemary to take over from her. Philip is shocked. Gaby says that Philip recommended her, but he says he did no such thing, and she would be the last person he would recommend. Rosemary had lied to Gaby. Philip says that Paul had warned him about her when he joined the company. It looks like Rosemary is trying to take over the business. Julie finishes inspecting Gough's hair, he's lice free. Helen reminds Julie to check the horse, and Julie says she already has. Julie tells Gough they can't keep the horse, so he'll have to take it home. Hannah complains again, saying this is the worst birthday she's ever had. Philip arrives and tells Helen that they have a business problem that they have to discuss with Cheryl right now. He drags Helen away saying this is urgent. Julie tells Hannah that she can keep the horse for the rest of the afternoon but then Gough will have to take it home. Hannah says that's fine as long as she can ride it, Julie agrees. Hannah and Gough ride the horse around the street, while Julie looks on pleased. Rosemary asks Debbie how the therapist session went. Debbie doesn't want to talk about it. Rosemary understands, as she saw a therapist in New York and found it great to have someone to talk to. Debbie is very pleased, she really likes Rita, and she seems to know exactly what Debbie is going through. 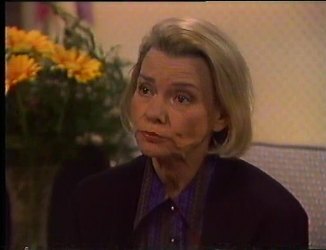 Rosemary warns her not to get too attached, Rita is only a therapist and she'll never be a substitute for her own family. Debbie says that if her family were more like Rita she wouldn't have the problems she has now. Hannah, Gough and Julie arrive; Hannah wants them to sing her happy birthday as Gough has to go soon. They agree to sing it again when Philip and Helen get back. They all sing ‘For She's A Jolly Good Fellow' for Hannah. Helen, Gaby and Philip are chatting to Cheryl. Helen says there's no real evidence that it's Rosemary. 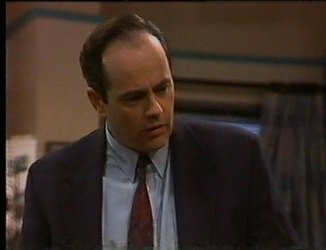 Philip says everything points towards her, and Cheryl says that Lou saw Rosemary at the bank talking to the manager, and the bank has a major investment in Lassiters. Helen insists its coincidence, though Philip says if it was just coincidence why did Rosemary lie to Gaby. Gaby says that Rosemary really pumped her for information about the business.